Back in the Sebastian River the water clarity has been dirty making it harder for anglers. 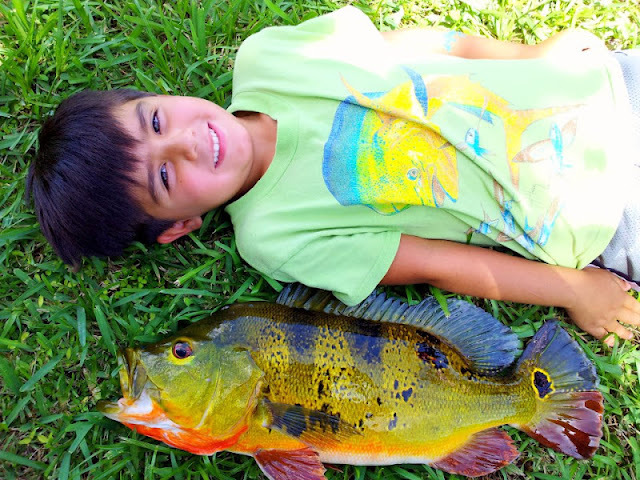 Reports stating that you pretty much have to throw your plug or live bait directly in front of the fish. Still with that being said, anglers have had luck with reds, tarpon and trout. Some snook being caught around the docks along with sheepshead, black drum and some nice size mangrove snapper. Early morning has proven to be the best to fish the flats for reds and trout. With the mullet run and the cooler water temps we have been having this has made fishing outstanding. Redfish, snook, jacks, ladyfish, snapper, flounder, blues and shark in great numbers. Pay attention to the tides when targeting snook! Mullet, mullet and mullet... 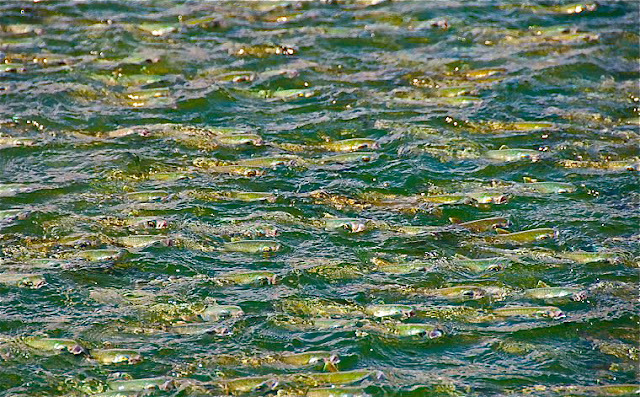 The snook, tarpon and whiting have been following the mullet run. Fish diving plugs or D.O.A. 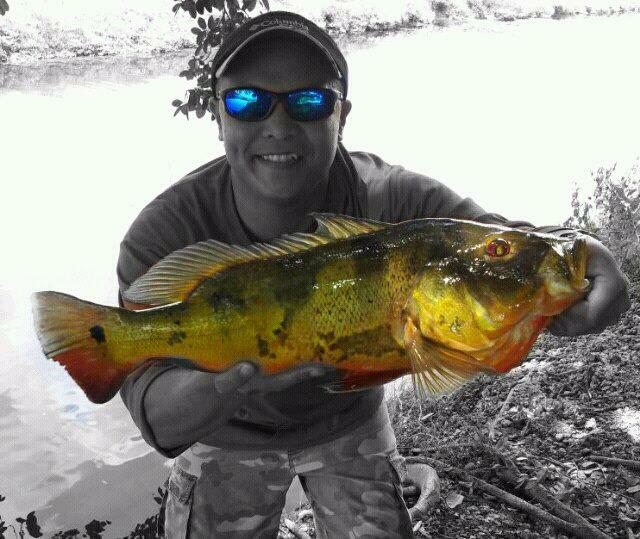 baitbusters if you are an artificial angler and the word is... fish "High" tide for best results. Some reports of pompano but a little on the smaller size. Though the unusually heavy crowds kept me away from the inlet for the better part of last week, I took the opportunity to fish my favorite dock behind Native Tackle over the weekend. Saturday was as good as it gets, though there were only two other anglers out there, we got on the fish. Sheepshead up to six pounds, monster whiting, mangrove snapper and even a couple of flounder hit the planks. Later in the day, the trout bite really turned on for me, it's a shame the other anglers had gone by early afternoon because the action was hot and heavy. I caught over twenty trout though sadly none were keepers, most fish were just barely under the minimum size. Sunday was a different game all together with the glamour species proving to be elusive. This brings me to a good point, when you cant seem to catch anything worth while, aim for a trash can slam. Believe it or not there are a few tournaments out there that center around this relatively unknown slam. To attain slam status you need to catch, ladyfish, catfish and a jack. To get a super slam, add a stingray and have both varieties of marine catfish. This slam saved my Sunday once I realized the other fish just weren't cooperate. With the weekend out of the way and after taking Monday off, I decided to head for the Inlet this morning. The mullet remained solid and easy to gather, however the predators following them provided only spotty action at best. Multiple snook were landed throughout the day though there was only one in the slot that I personally witnessed. The reds came over the rails steadily if not slowly with a handful of keepers caught for the day. Bluefish, jacks and ladyfish became thick late in the day providing light tackle fun for those not after anything in particular. 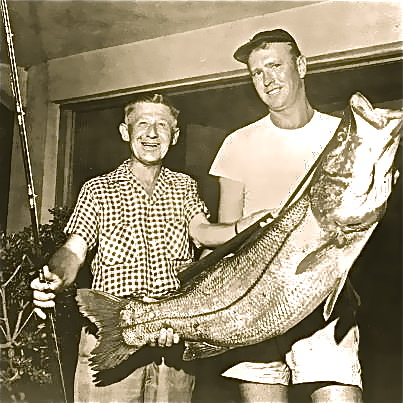 As for me, I had one fair sized mangrove snapper of fourteen inches and one forty pound red. That big bull made my day in a big hurry. After releasing the fish, I didn't really care If I had a keeper. Once more, I reccomend using shrimp around the docks and live finger mullet at the inlet. There has been a nice trout bite all this week. DOA shrimp Deadly, Combos or live baits can get you hooked up. 09-26-12 WEDNESDAY: FISHING HAS BEEN GOOD THIS WEEK! The weather has cooled down just a bit, and the folks trying their luck fishing at the Inlet have caught so many varieties of fish. Some catches this week include Redfish, Snook, Flounder, Snapper, Jack Crevalle, Ladyfish, and even the finger Mullet are running. Today's photo was sent to us by Richard Stone. 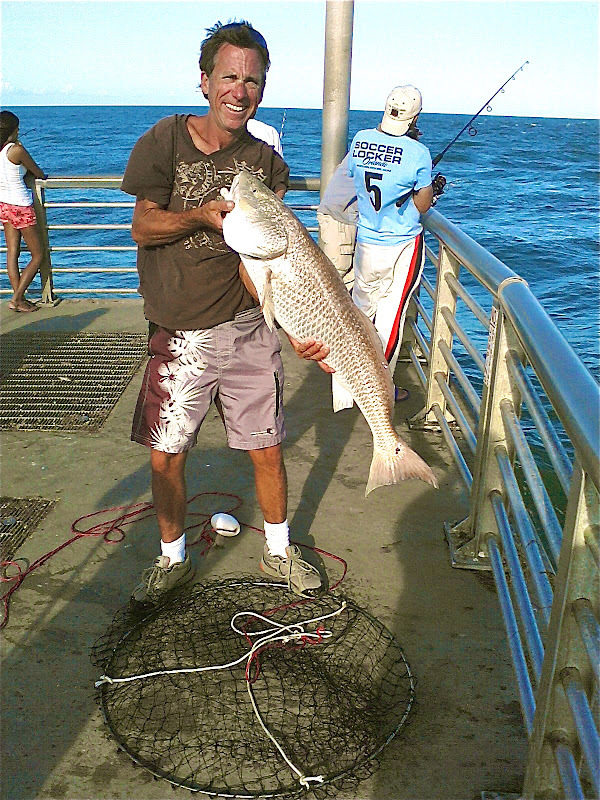 Richard caught this oversized Redfish on live finger mullet. Richard released the fish unharmed right after the photo. The inshore fishing has been good - the mullet are starting to show up on the flats. There have been some nice snook and big trout in with a few reds mixed in at first light. The trout fishing has been ok in about 5ft on soft baits once the sun gets up to the north of north bridge . The inlet and beach are still producing some snook and tarpon in the mullet schools with some jacks and blue fish mixed in. Flounder are starting to show up at the jetty with a few being caught on live shrimp. Looks like the mullet run is picking up speed. Tons of mullet in the inlet are attracting a variety of fish species. A few Flounder have been caught, adding to the fall bounty. The cooler temps are definitely improving the fishing conditions. to target. Lots of Mullet so the bite run most of the day,fi it looks like a Mullet throw it and lets see what the surprise is. you will notice he swims a little different now cast the fish into the bait school and hang on. Now if the weatherman will give us a few days without rain we could get back to some really good fishing..
"Jacked" or should I say "Groupered"
Nylon jigs, there are as many ways to fish them as there are different styles and colors. No matter how you like to fish them, the fact remains they catch BIG fish. Let’s focus on flairhawks for BIG snook. For something as simple as a leadhead with some nylon tied to it there is a lot to consider when choosing the right jig for the right situation. We’re going to keep this very simple, if you’re fishing in a river around a bridge or an outgoing tide at an inlet use a chartreuse jig. If you are fishing on the beach or in clear water conditions use a jig with white nylon, preferably with a little sheen. Snook will hit a jig based on profile and action more than color, but for those who want to complicate things, your jig should blend into its surroundings and stand out all at the same time. 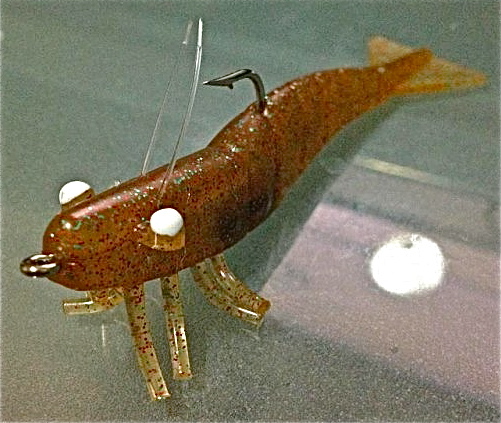 The two most common flairhawk jig styles are the skimmer jig and the bullet style jighead. Both work well in most situations, however snook hit based on profile and action so there are some things to consider. Are the snook feeding on finger mullet or some type of bait with a narrow profile? If they are, a jig with a narrow profile is what you want to use. If they are feeding on croaker or something with a larger profile, a jig with more flair and a larger profile is the way to go. When the snook are feeding on crabs you want to bang the bottom with a skimmer style jighead. Perhaps the most important factor in choosing which jig to pull out of the box. Snook hit based on profile and action, but a snook won’t hit what it can’t see. Put the jig in the strike zone and your odds of catching a snook goes up three fold. There is a definite learning curve here and you will lose jigs in the process, but getting the jig at the right depth and location at the right time is the big secret to jig fishing. There is an up side to hanging up on the bottom…when you find the hang-ups there is a good chance you have found where the snook are hanging out. Present the jig properly around these hang-ups and the snags turn into big snook! Somebody got the word out because there is a crowd on both jetties today. Mullet are still moving around attracting the usual predators with a few Blues starting to show. 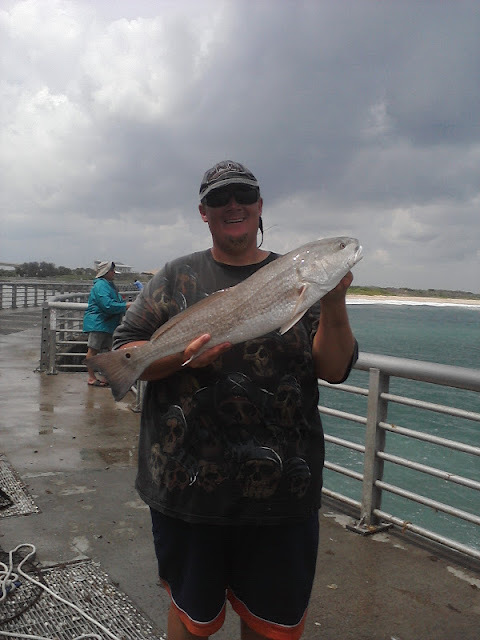 Over the weekend there was a good number of keeper Reds and Snook landed. Jacks and large Ladyfish are continuing to provide entertainment. Also, today some small Pompano have entered the mix. All signs are pointing to an explosive Fall season when the fronts start to move the mullet. Photo 1 today is 12 year old Leore Genoune with his first keeper Sebastian Inlet Snook. Leore was fishing with his younger brother Eytan and mother Meir. Great catch! The inlet fishing and beach fishing has still been good to the north and south with tarpon and snook on live bait and plugs. There was a few trout and redfish around to the north of north bridge. South jetty has been good with a few snook and flounder. Sea trout have been hanging around sand bars and drop offs around the river this week. DOA shrimp, top water or live baits can help you find where they might be feeding on any given day. Redfish have been caught while fishing the mangroves in the river and also in the shallow flats as well. Snook can be found around docks, sea walls and along the inlets of the river. You might also try some of the spillways around the area with all the recent rains running through them. DOA Terror Eyz, Bait Busters and live baits are great when fishing for snook. Low tides in the evening have slowed down the productive fishing in the surf. Last night the low tide and calm weather caused the mullet to scatter out and not be as concentrated as the past few evening. The fishing inshore has really started to improve however. Reports of snook, trout, and redfish are becoming more frequent. I heard of a 33" sea trout caught yesterday on a Berkley Gulp jerk bait. There have also been quite a few redfish and snook on the flats as well. The trout bite has remained steady, fish early morning. Some under sized reds along with the trout. For best results use live shrimp or D.O.A. Cal shad or shrimp Bloodworms. Mangrove snapper, sheepshead and black drum around the docks. Outstanding pompano and tarpon bite back in the Sebastian river. Reports of Doormat size flounder being caught as well! The brisk cool air has made early morning fishing very nice! Lane and mangrove snapper being caught on outgoing tide and the first hour of incoming. After that.... the bite slows. Reports of Snookhas still remained steady, fish at night on outgoing and all the anglers we have spoke with get their slot size fish! Oversize reds, jacks, ladyfish and black drum has been the treat of the inlet this past week! The mullet run is here.... so you know what that means.... outstanding surf fishing! Snook, tarpon, blues and mackerel have been the action of the week! 09-20-12 THURSDAY: ANOTHER FISHY DAY! EVERYTHING IS BITING! Another Fishy day. Everything is biting, including more noseeums. Best bait for them is bare arms and legs! For the Reds, Snook, Ladyfish, Jacks and a few Spanish Mackerel, use either live mullet or cut dead mullet. Redfish seem to prefer the cut bait. Rigs of choice are typically 16 lb. test tackle with a 1 to 2 ounce slip sinker before the swivel, then 20 lb. to 40 lb. leader and hook ranging from #2 to 1/0. Photo #1 is Justin Werner with a 32 inch Snook. 09-19-12 NOSEEUMS ARE BITING AS WELL AS LOTS OF FISH! Light wind and calming seas are turning on the fish bite and also the Noseeums or biting midges. When the Noseeums are bad, as they are this morning, the fishing is usually good. A lot of fish are being caught on a variety of baits. Many big Reds are chasing plugs, especially on the outgoing tide. Look for that action this afternoon. There has been numerous slot size Redfish and Snook landed on the jetty. 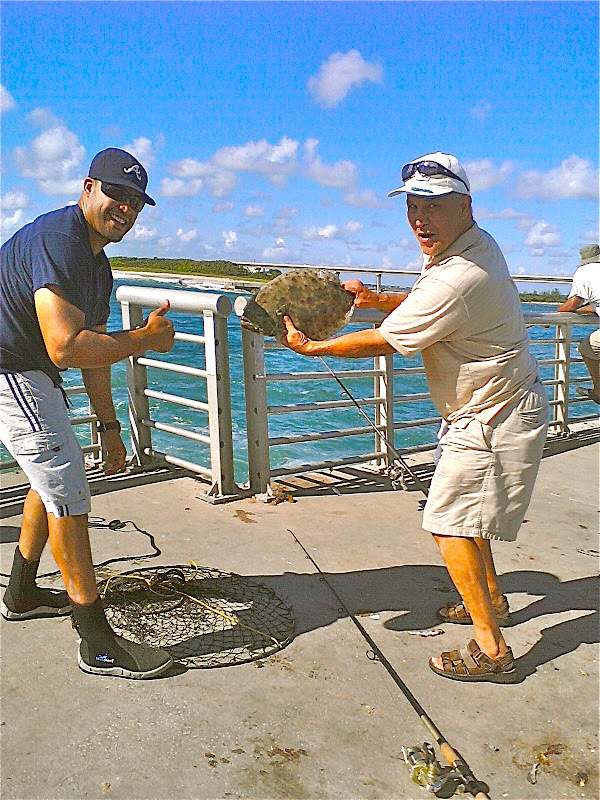 Jacks, Snapper, Ladyfish, Tarpon, Sharks and many others are in the mix. A large Spinner Shark was caught on a plug this morning. As Tommy with the Bait Shop indicated, "It looks real fishy out there". 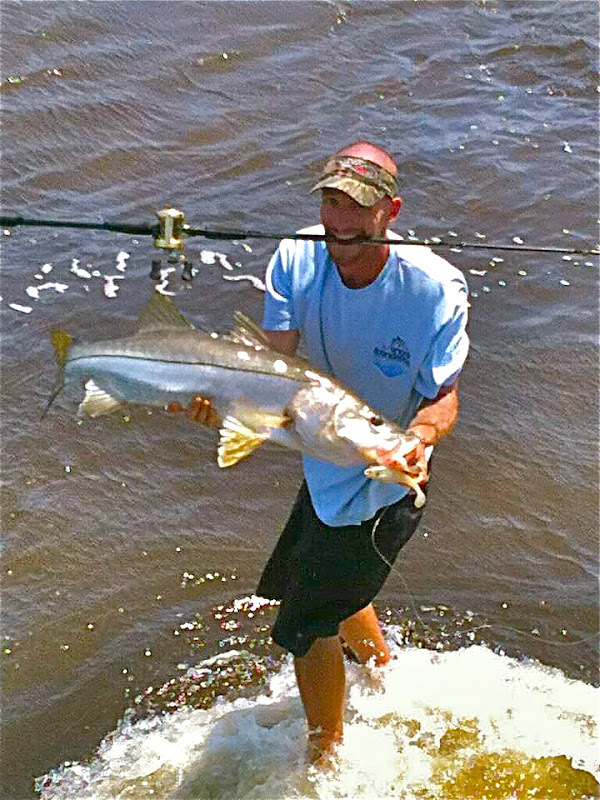 Photo 1 is of Mike White with a slot size Snook. Nice keeper. Photo 2 is Mike Misserville with a 40 to 50 lb. Tarpon. Mike says it put up a real fight! 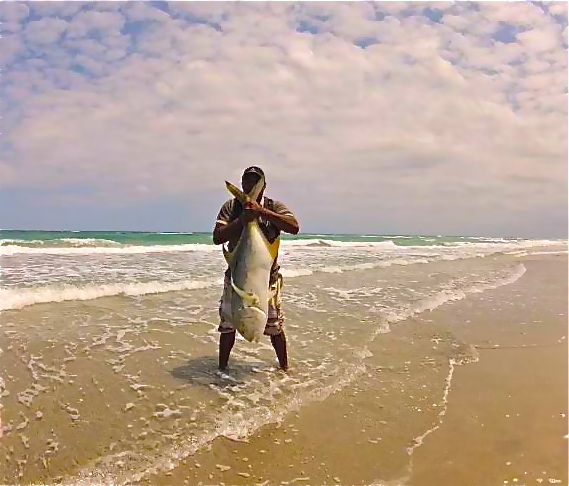 The beach and inlet fishing is still red hot in the mullet schools with snook and tarpon all over the beach and inlet with a few reds and jacks mixed in, Live mullet has been the most productive but windcheaters and jigs have been working. They're catching a few flounder at south jetty on live shrimp and the bigger ones on live mullet. Trout fishing is still steady on soft baits to the north and south in about 3ft to 5ft of water. Once again the afternoon outgoing tide at the inlet produce countless redfish in a wide variety of sizes for those fishing in the crowd on the end of the north jetty. Fish up into the mid thirty pound range were caught but slot sized keepers came over the rail much more frequently. As usual, the bait of choice today was live finger mullet but those fishing with mojarras or hand picked shrimp also scored well. The snook proved elusive with only one over slot brute caught for the day. Though I had arrived just after eight AM, I chose not to join the crowded end of the jetty until the tide began to go out with authority to avoid tangling issues but also to see if I could pull a flounder or two out of the trough. Unfortunately, I failed in that particular endeavor but for one lucky angler fishing in the crowd a flounder sandwich emerged from the murk in the form of the fine example in photo number one. In photo two we have an angler displaying the bull red he caught on a topwater plug before quickly releasing it to live to fight another day. 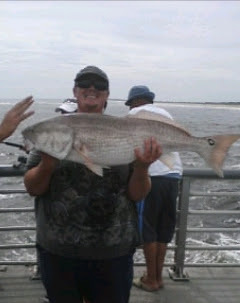 Photo three is of myself with a thirty one inch red I caught just before it was time to go. The last photo is a bonus bull red caught by my good friend Chris last week just after an afternoon rain squall. His fish taped out at forty eight inches and was of course released unharmed. If anybody reading this wants to stop by and say hello, I'll be hitting the inlet once again on Wednesday afternoon at two. Until next time, good fishing. Anticipation is the word this week for inlet fishing. Mullet are starting to move and there is a hint of fall in the air. We are getting good reports of Redfish, Snook, Jacks and Ladyfish and a few sizable Bluefish. Catches are reported on shrimp, live mullet and cut dead mullet. The water is still a little dirty but is expected to clear this week as winds and seas diminish. Look for action to explode this week as temps moderate and the barometer shifts with approaching weak cold front. 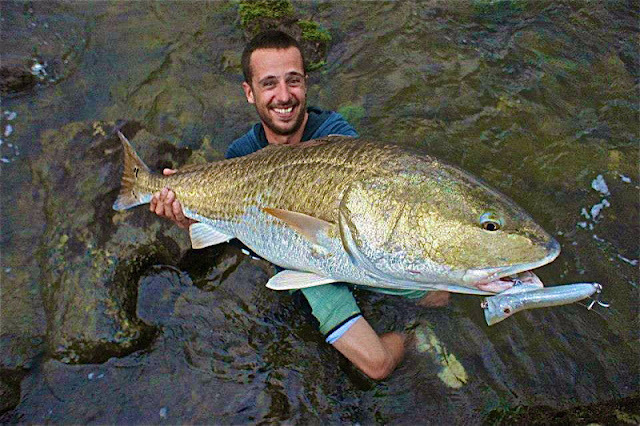 Our photo today is the monster Redfish taken yesterday by Olmo George. The fish was released after taking a live bait intended for Snook. He said many reds came over the railing and some were in the keeper slot. Third up in our “Snook Seminar Series” will be focused all on fishing swimbaits. 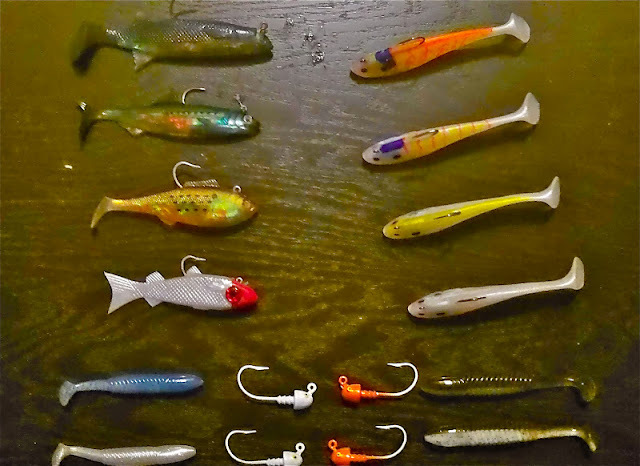 Swimbaits, which come in various forms, are making a huge splash in the bass fishing world; and are slowly starting to cross over into the saltwater world. These life like baits are very exciting to fish, and will often draw strikes when not much else will. Swing by the shop this Thursday night (September 20th) at 6pm for a rundown on everything you need to know to step up your snook fishing game with these baits. me being the lazy angler that I am. Bridges , well it is a long catch list, Drum,Sheephead, Blues, Snapper, Lady Fish, Jacks and the list goes on, bridges have been hot all day as long as the water is moving, action all day depending on the species. Snook, the worst the weather the more active they become but if you will wait for sun down, pick a bridge, cast a sinking lure or a live bait you will catch a fish, 28”/32”” is the slot. few Snook, just have to get them the bait before the Jack’s find your offering. 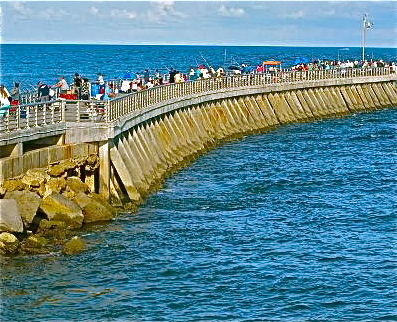 It is very pretty at the Sebastian Inlet today. 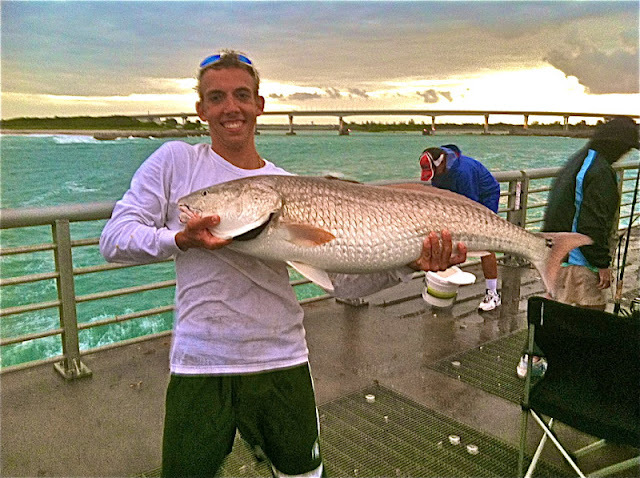 Over the weekend, there were several catches including lots of Redfish, some nice Snook, both Mutton and Mangrove Snapper, Bluefish and Ladyfish. Today's photo is terrific - these nice Redfish were caught Sunday by Leore and Eytan Ganon. The mullet run is on with mullet showing up all over the beach and inlet - the tarpon and snook have been in them along with ladyfish and jacks with a few redfish mixed in. Live Mullet have been the best or Bomber Windcheaters in the green and black. There have been a few reports of snook caught on jigs at the jetty at night on the incoming tide. The trout fishing has been ok with a few fish in 3ft to 6ft of water in both north and south. 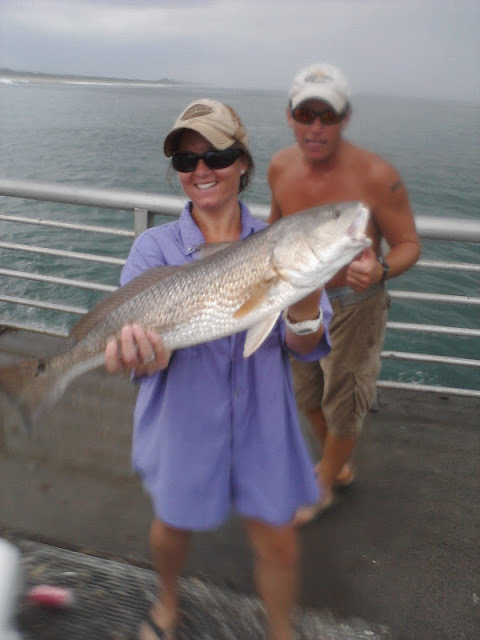 09-14-12 FRIDAY: LOTS OF FISH SPECIES BEING CAUGHT AT THE INLET! The cooler breeze and weather has been nice the past few days; maybe we are past the sweltering heat of summer. Many species of fish have been caught this past week, including keeper Reds, a few Snook, Mangrove Snapper, Jack Crevalle, Ladyfish, and even the Mullet are running! Today's picture is of Inlet regular Chuck Fischer of Satellite Beach, This catch is from 8/31/12 - a nice Black Drum. Monday and Tuesday both turned out to be fantastic, albeit wet, days of fishing for both those fishing inland and along the inlet and beaches. Once again, the flavor of the week seems to be a steady mix of redfish and snook all around Sebastian inlet with a few pompano making a showing along the beach north of the inlet. The weather has been less than beautiful for the last couple of days but that same, wet, nasty weather that we humans dislike more often then not really gets the fish fired up. Monday morning I showed up at the north jetty just past eight AM and already the regulars were leaving with their limits of snook and reds. I wound up catching my keeper red for the day on my first cast with a live finger mullet and catching a total of sixteen reds for the day. My first photo this time is of visiting angler Lauren with her just over slot red and the second photo is of myself with thirty incher. If you want to get in on the big game side of being and On Foot Angler, I suggest breaking out the heavy spinning outfits and big cut baits because last night, Tuesday, the black tip sharks were out in force. I managed to bring two to the jetty while soaking lady fish chunks in search of bull reds. The first fish was approximately eighty lbs or so while the second was well over a hundred possible one twenty five. no pictures of the toothy critters I'm afraid, night fishing and wet weather make taking worthwhile photo's a difficult task. Until next time, good fishing. 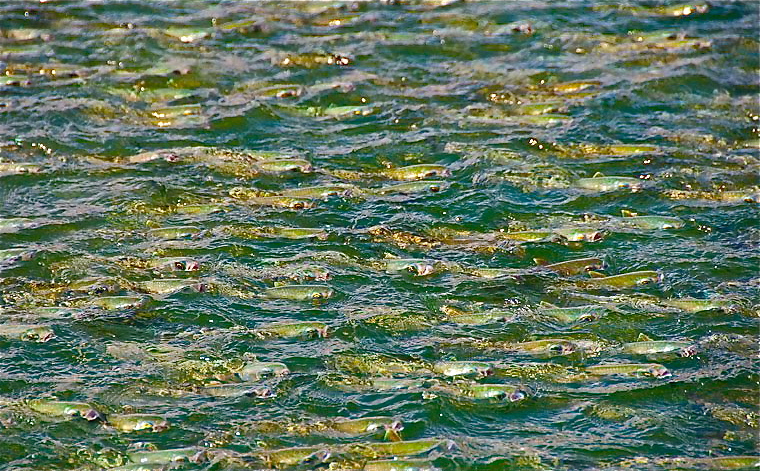 The mullet run has started and you will find plenty of mullet around the river and in the surf this month. The DOA Bait Buster is a great lure to fish around the mullet schools. Look for snook, tarpon and jacks to be chasing bait along the beach. It's a great time of year to fish! We have clear skies this morning, winds are blowing out of the East-Northeast at 9 mph, gusting to 15 and the water is choppy. Small craft should exercise caution. An update from inlet regular Mike Ricciardi said yesterday morning was another action packed adventure. 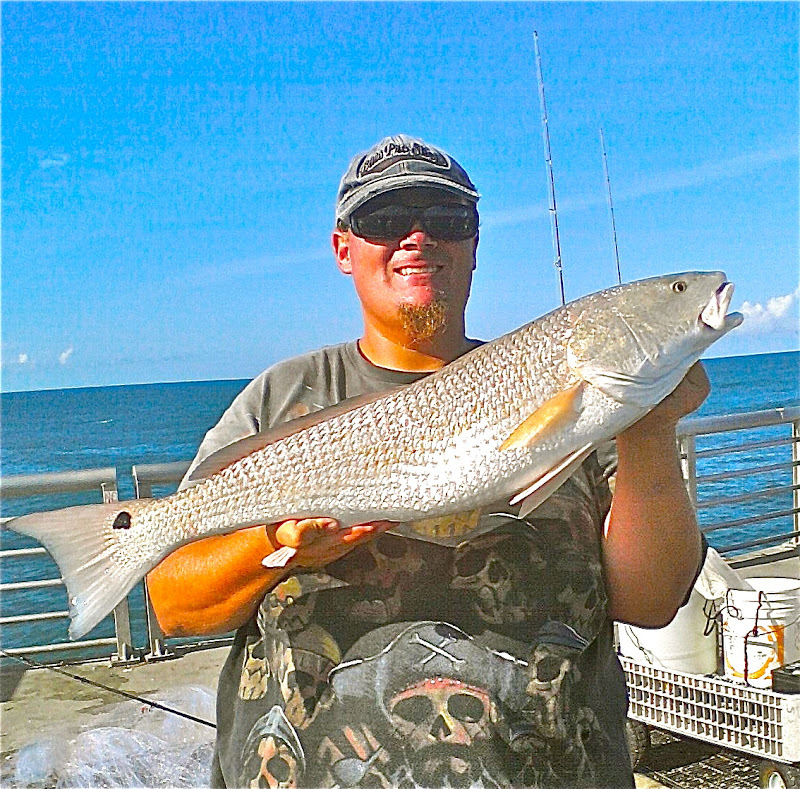 Almost everyone fishing the end landed their slot sized Redfish and more. Finger mullet were plentiful and the bait of choice, although live shrimp were working as well. Photo one features Chris Robinson of W. Melbourne with a double! Chris landed 28" Snook and 24" Red using finger mullet yesterday morning. Photo two features Mike Ricciardi with a triple he landed yesterday; a slot Red, Black Drum and Mutton Snapper using finger mullet and dead shrimp. Photo three is of Chuck Fischer of Satellite Beach. Chuck landed this 25" slot Red after landing a few that were short. Photo four features Mike White of Sebastian with two very nice Mutton Snapper he landed on Aug. 31st. Mike was using mojarra to land these beauties and he also caught three nice Mangrove Snapper in the process! Mike estimated the large Mutton to be between 8 - 9 lbs. Our last photo today is of Steve Decoulas of Fort Lauderdale with a good sized Black Margate. For all of you anglers with an IPhone, there's an application that was invented by two Jupiter fishing buddies called Fish Rules App. The app will find regulations and seasons for most saltwater species in State or Federal waters from NC through TX. For more information, go to: http://www.fishrulesapp.com.